Map of The Bermuda Islands Alias Somers Islands. 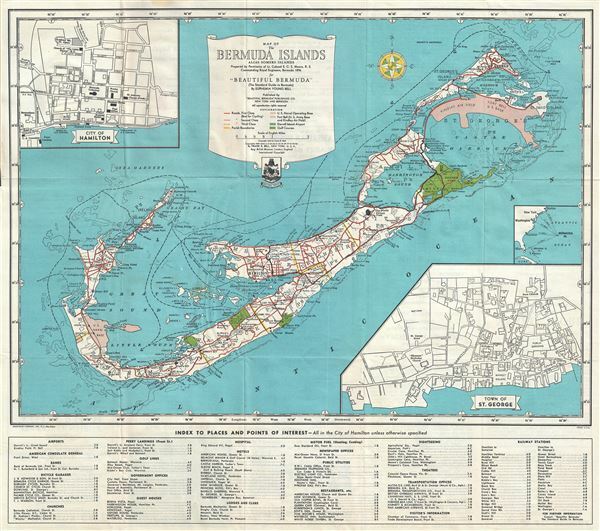 This is a beautiful 1945 map of the Bermuda Islands by Euphemia Young Bell. It covers the Bermuda or the Somers Islands in exquisite detail, noting roads, surrounding islands and reefs, towns, golf courses, churches, U.S. Bases, airports, railroads, shipping lines, points or interest, bays and other information useful to the traveler. An index along the bottom of the map lists important points of interests in the city of Hamilton. An inset map of the City of Hamilton appears in the top left quadrant, while another inset in the bottom right quadrant features the Town of St. George. A small inset in the lower right quadrant depicts the location of Bermuda with reference to the United States. This map was prepared by Euphemia Young Bell and published by 'Beautiful Bermuda' Publishing Co. It was copyrighted by Frank R. Bell in 1945 and was specially printed for 'Bermuda Bicycle Garage, Queen St. – Hamilton as The Standard Road and Railroad Map of the Beautiful Bermuda Islands. Very good. Minor wear along original fold lines. Advertisements on verso. Attached to original paper binder.